She is traveling, something she will probably be doing more of now, after the breakup. She has begun noticing the distraction of other people again. At the airport, a couple embraces – she the traveler, he the one to see her off. The passion between them is like heat lightning – silent, only noticeable if you are looking, filling the air with electricity. He watches her progress trough the security line. She turns once, twice, again. With each turn she moves up on her tiptoes, though she has a direct line of sight to his passionate unsmiling face. The tiptoes are the nonverbal equivalent of a banner, or a bugle, a signal that recognizes his love even as it proclaims her own. She is not lovely – a face that is pale and too freckled, eyes sparsely lashed. An uncertain mouth, hair that tried and failed for Titian. Her age is indeterminate – no longer young, but still youthful. Not a girl, but in her searching eyes, something of the girl remaining. But to see her turning, on tiptoes, again and again, is to begin to see her as he must: how her green eyes are jewel-like. How her skin is so transparent the tracery of blue veins shows clearly at her temples and neck. How the red of her hair is like a subdued fire, banked against the cold: January embers. How, even after the machinery of the airport has swallowed her, she still glances back. 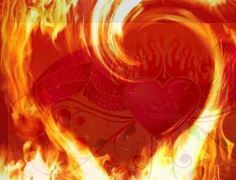 The heart is an organ of fire, she read once, before the breakup. The words of a poet, but the woman knows better. She wants to warn the mermaid woman, In every couple there is a lover, and a loved. She wants to tell the girl-woman, you must never trust your senses; do not trust what you know, even the inarguable physics of the heat that is fire, the cold that is ice. She wants to tell her about fire that melts, and ice that burns. How betrayal can turn your bones to smoke. How the heart is like sand, and love like the sun, fusing it to glass. How it can be smashed and left forgotten under the stern unflinching eye of the sun, how even after the coyotes and vultures have scattered the pieces, how even after the blood-spotted dust has blown away on a breath of hot desert air, how even after all of this love will still survive, and the empty place where your heart was will still belong to him. Nothing can prepare us for trickery of the heart. Yet maybe, just maybe – if you’re lucky enough you defy odds and find that one you will grow old with. Next week my husband and I celebrate our 31st anniversary.We linger at airports, can’t go through a day without talking on the phone 3 or 4 times, and hold hands like teenagers.